The 81,000 ton USS Forrestal was the first operational supercarrier, though United States would have been in service earlier, had it been completed; its cancellation triggered the "Revolt of the Admirals." United States would have had a nuclear strategic bombing role, rather than the multipurpose role that all subsequent supercarriers have had, carrying tactical aircraft only for defense. The 72,000 ton armored Japanese carrier Shinano of the World War II era was almost heavy enough to be considered a supercarrier, but lacked several defining features, such as catapults, arrestor cables, and angled flight decks, and also did not possess the sheer size of modern supercarriers. Because of the angled deck and large deck area, supercarriers can have a far larger island than conventional carriers, greatly improving both their aviation capabilities and their capability as flagships. The U.S. Navy is currently the only major sea power, and all completed supercarriers are American, of which the 100,000 ton Nimitz class is the most prolific. However the governments of the United Kingdom and France have both approved plans to build several new large carriers for their navies. The Thales Group has been commissioned to build both country's ships, which will be 50-60,000 tons, still significantly smaller than the American Nimitz class, but large enough to be considered supercarriers. They are scheduled to become operational between 2012 and 2015. For more information, see Royal Navy CVF programme and Future French aircraft carriers. Adionionally, in the 1980s the Soviet Union began construction of Ulyanovsk, an 85,000 ton nuclear carrier comparable in size to earlier American supercarriers. Ulyanovsk was 40% complete when cancelled (along with a follow-on vessel) due to lack of funding after the end of the Cold War in 1991. Nimitz-class supercarriers are a class of ten nuclear-powered aircraft carriers in service with the United States Navy. With an overall length of 1,092 ft (333 m) and full-load displacements of over 100,000 long tons, they are the largest capital ships in the world. Instead of the gas turbines or diesel-electric systems used for propulsion on many modern warships, the carriers use two A4W pressurized water reactors which drive four propeller shafts and can produce a maximum speed of over 30 knots (56 km/h) and maximum power of around 260,000 shp (190 MW). As a result of the use of nuclear power, the ships are capable of operating for over 20 years without refueling and are predicted to have a service life of over 50 years. They are categorized as nuclear-powered aircraft carriers and are numbered with consecutive hull numbers between CVN-68 and CVN-77. All ten supercarriers were constructed by Newport News Shipbuilding Company in Virginia. USS Nimitz, the lead ship of the class, was commissioned on 3 May 1975 and USS George H. W. Bush, the tenth and last of the class, was commissioned on 10 January 2009. Since the 1970s, Nimitz-class carriers have participated in many conflicts and operations across the world, including Operation Eagle Claw in Iran, the Gulf War, and more recently in Iraq and Afghanistan. The angled flight decks of the carriers use a CATOBAR arrangement to operate aircraft, with steam catapults and arrestor wires for launch and recovery. As well as speeding up flight deck operations, this allows for a much wider variety of aircraft than with the STOVL arrangement used on smaller carriers. An embarked carrier air wing consisting of up to around 90 aircraft is normally deployed on board. The air wings' strike fighters are primarily F/A-18E/F Super Hornets and F/A-18C Hornets, after the retirement of the F-14 Tomcat. In addition to their aircraft, the vessels carry short-range defensive weaponry for anti-aircraft warfare and missile defense. The Nimitz-class aircraft supercarriers were ordered to supplement the aircraft carriers of the Kitty Hawk class and Enterprise class, maintaining the strength and capability of the US Navy after the older carriers were decommissioned. The ships were designed to be improvements on previous US aircraft carriers, in particular the Enterprise and Forrestal-class supercarriers, by using a more modern design, although the arrangement of the ships, in particular that of their flight decks, is relatively similar to that of the Kitty Hawk class. Among other design improvements, the two reactors on Nimitz class carriers take up less space than those on Enterprise, which uses eight, meaning there is more interior space. This, along with a more generally improved design, means that Nimitz-class carriers can carry 90 percent more aviation fuel and 50 percent more ordnance when compared to the Forrestal class. The US Navy has also stated that the carriers could withstand three times the damage sustained by the Essex class inflicted by Japanese air attacks during World War 2. The hangars on the ships are divided into three fire bays by thick steel doors that are designed to restrict the spread of fire. This addition has been present on US aircraft carriers since World War 2, after the fires caused by Kamikaze attacks. The first ships were designed around the time of the Vietnam War, and certain aspects of the design were influenced by operations there. To a certain extent, the carrier operations in Vietnam demonstrated the need for increased capabilities of aircraft carriers, over their survivability, as they were used to send sorties into the war, and were therefore less subject to attack. As a result of this experience, Nimitz carriers were designed with larger stores of aviation fuel and larger magazines in relation to previous carriers, although this was partly as a result of increased space available due to the arrangement of the ships' propulsion systems. A major purpose of the ships was initially to support the US military during the Cold War, and they were designed with capabilities for that role, including using nuclear power instead of oil, for greater endurance when deployed in blue water, and the ability to make adjustments to the carriers' weapons systems on the basis of new intelligence and technological developments. They were initially categorized only as attack carriers, but ships have been constructed with anti-submarine capabilities since USS Carl Vinson. As a result, the ships and their aircraft are now able to participate in a wide range of operations, which can include sea and air blockades, mine laying, and missile strikes on land, air and sea. The total cost of construction for each ship was around $4.5 billion. In addition to the aircraft carried onboard, the ships carry defensive equipment for direct use against missiles and hostile aircraft. These consist of either three or four NATO RIM-7 Sea Sparrow missile launchers, designed for defense against aircraft and anti-ship missiles as well as either three or four 20 mm Phalanx CIWS missile defense cannons. USS Ronald Reagan has none of these, having been built with the RIM-116 Rolling Airframe Missile system, two of which have also been installed on USS Nimitz and USS George Washington. These will be installed on the other ships as they return for Refueling Complex Overhaul (RCOH). Since USS Theodore Roosevelt, the carriers have been constructed with 2.5 in (64 mm) Kevlar armor over vital spaces, and earlier ships have been retrofitted with it: Nimitz in 19831984, Eisenhower from 19851987 and Vinson in 1989. The other countermeasures the ships use are four Sippican SRBOC (super rapid bloom off-board chaff) six-barrel MK36 decoy launchers, which deploy infrared flares and chaff to disrupt the sensors of incoming missiles; an SSTDS torpedo defense system, and an AN/SLQ-25 Nixie torpedo countermeasures system. The carriers also use Raytheon AN/SLQ-32(V) electronic warfare systems to detect and disrupt hostile radar signals in addition to the electronic warfare capabilities of some of the aircraft onboard. The presence of nuclear weapons on board U.S. aircraft supercarriers since the end of the Cold War has neither been confirmed nor denied by the U.S. government. As a result of this, as well as concerns over the safety of nuclear power, the presence of a U.S. aircraft carrier in a foreign port has occasionally provoked protest from local people, for example when USS Nimitz docked in Chennai, India, in 2007. At that time, the Strike Group commander Rear Admiral John Terence Blake stated that: "The US policy is that we do not routinely deploy nuclear weapons on board Nimitz." Concern was also voiced after the arrival and docking of the USS George Washington in Yokosuka, Japan on 10 March 2011 following the 2011 Tohoku earthquake and tsunami disaster. Hundreds of protesters were present to make their voices heard concerning the safety of the nuclear reactor on board the warship providing aid. USS Ronald Reagan belongs to the Nimitz-class supercarriers, a line of nuclear-powered aircraft carriers in service with the United States Navy, are the largest capital ships in the world, and are considered to be a hallmark in the superpower status of the United States of America. These aircraft carriers are numbered with consecutive hull numbers starting with the CVN-68. The letters CVN denote the type of ship: "CV" is the hull classification symbol for aircraft carriers, and "N" indicates nuclear-powered propulsion. The number after the CVN means that this is the 68th "CV", or large aircraft carrier. Nimitz (CVN-68), the lead ship of the class, was commissioned on September 18, 1976. George H. W. Bush (CVN-77), the tenth and last of the class, was built by the Newport News Shipbuilding Company, and she entered naval service on January 10, 2009. The USS George H.W. Bush will be the first transition ship to the new Gerald R. Ford-class, the first ship of which began construction in 2007 and will incorporate new technologies including a new multi-function radar system, volume search radars, an open architecture information network, and a significantly reduced crew requirement. To lower costs, some new technologies were also incorporated into the Ronald Reagan, the previous carrier to the George H.W. Bush, though not nearly as many as will be involved with George H.W. Bush. Because of construction differences between the first three ships (USS Nimitz, Dwight D. Eisenhower, and Carl Vinson) and the latter seven (from Theodore Roosevelt on), the latter ships are sometimes and erroneously called Theodore Roosevelt-class aircraft carriers, though the U.S. Navy considers them to all be in one class. As the older aircraft carriers come in for their Refueling and Complex Overhaul, they are upgraded to the standards of the latest ships. By tonnage, the Nimitz-class warships are the largest aircraft carriers built so far, holding the world record for displacement of any naval war vessel. After the George H.W. 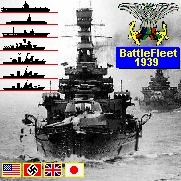 Bush, was completed, the ten ships of this class will total just under a million tons in combined displacement. Although the Nimitz-class ships are the heaviest ships in the US Navy fleet they are not the longest ships in the fleet, with that distinction belonging to the aircraft carrier Enterprise. 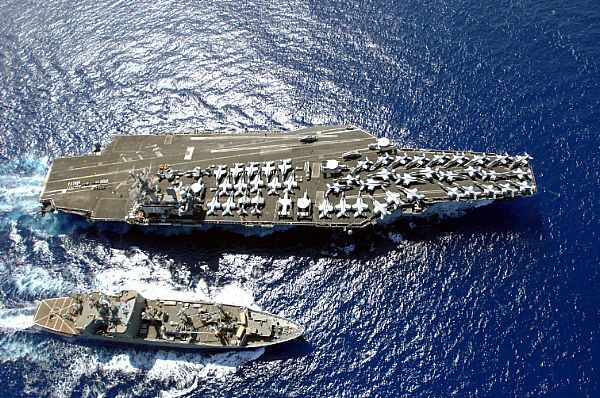 The USS Nimitz was the first warship of this class to undergo her initial refueling during a 33-month RCOH at the Newport News Shipbuilding Company in Newport News, Virginia, in 1998. The Dwight D. Eisenhower was next, completing its RCOH in 2005. The Carl Vinson began its RCOH in late 2005. The USS Abraham Lincoln entered the large drydock at Puget Sound Naval Shipyard on September 8, 2006, but she left ahead of schedule on December 18. John F. Kennedy Aircraft Carrier (CV-67) (19672007). Three different shipyards were used to construct the ships. Kitty Hawk was built at New York Shipbuilding Corporation, Constellation at New York Naval Shipyard, America and John F. Kennedy at Newport News Shipbuilding. John F. Kennedy is similar to the earlier units in flightdeck arrangement and propulsion, but has enough differences that she is often placed in her own class. Propulsion consisted of four Westinghouse geared turbines, 280,000 shp, four shafts with eight 1,200 psi Foster Wheeler boilers.